I stayed at hostel Downtown for 3 days in a female 8 bed dorm with my friend. Staff was very nice and friendly. Katie gave me some nice tips for my next destination and she was very helpful and social. The hostel organised some free events which was nice. Everything was clean and the hostel was at a really great location so we walked everything. It's really easy to meet new people so I would recommend hostel Downtown for solo travellers but I'm sure that it's good for families as well. I enjoyed my stay here. There was such a good atmosphe! The hostel organizes a lot of activities and it is near the center. Certainly recommended for solo travellers!! wij verbleven rondom NYE in dit hostel & een hele leuke tijd gehad. zeker een aanrader voor de soloreiziger. Very social place, many activities organised by staff. It's very easy to meet new people here. Katie's free walking tour through Prague was also great! Great hostel! Location is perfect, near the river and walking distance from all the places you want to see. Especially the staff is very nice and will give lots of tips, guided tours and even free food :) General vibe is very good, easy to meet other people and do sightseeing together. I would stay at this hostel again for sure! Tip: go to the top floor of the dancing house, buy a beer or coffee and enjoy a wonderfull view! Or go to Letna park for a nice view and lots of skaters. Het boeken verliep niet helemaal soepel door een storing, dat had beter opgelost kunnen worden. Ik ben naar hostelworld doorgestuurd maar daar moest ik extra betalen. Very nice hostel with a lot of different activities: walking tours, cooking, minigolf, pubcrawls, talent nights etc. The staff was really friendly and engaging. I would come definitly come back here. Very good and nice hostel! A perfect location near to the river and the big squares where you can party. Also the staff is very nice and helpfull. Only real point of critique are the beds. Those are basically too soft and are not very good for a good night rest. Also when you're sleeping in a room next to the street, this can be noisy. But overall was the experience perfect and lovely. 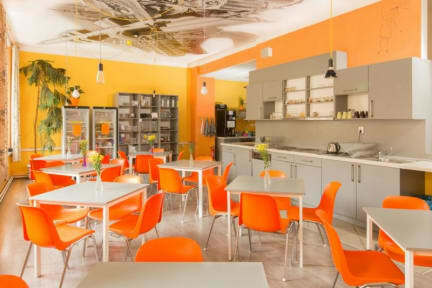 I can recommend this hostel to everybody and I would return here for a next stay in Prague!